I used to hate cooking pasta. Without fail, each and everytime, my pot of boiling water would overflow leaving a mess to clean up on the stove top. I tried different things to get it to stop doing it, but they never seemed to work that well for me. I recently discovered a solution though! Meet Kuhn Rikon KOCHBLUME Spill Stopper designed to stop pots from boiling over. No more mess! I hated always having to babysit my pot of pasta boiling on the stove. Putting a lid on it never works and most times I’d end up turning the heat down so it would stop boiling over. With my new Spill Stopper, I can cook my pasta and leave it be without worrying it will make a mess. I can get my other prep work done while I’m waiting for pasta to cook. 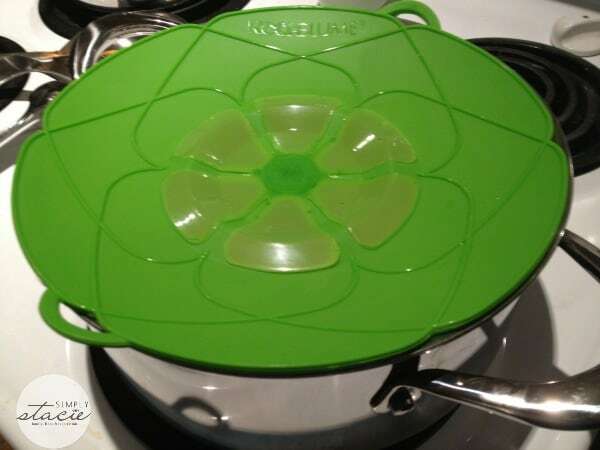 The Kuhn Rikon KOCHBLUME Spill Stopper was invented and designed in Germany. It’s made from a heavy silicone heat-resistant material that can withstand temperatures up to 400º. It’s designed to fit pots and pans 5½ to 9 inches in diameter. I’ve used it on different sized pots and pans and it fits almost all of the ones I own. 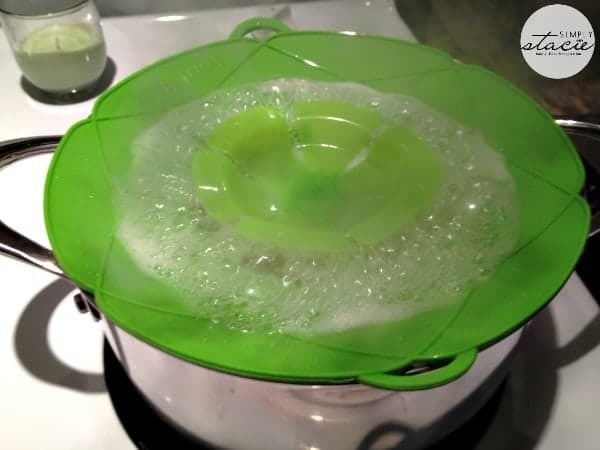 You can use it as a lid and splatter guard and it’s great to use when cooking pasta, rice, soups, or anything that is known to make a mess! It’s also microwave and dishwasher safe. I wash mine in the dishwasher on the top rack. It’s really easy to use. Just place on top of your pot with the “Stop” facing up and leave it work its magic! The water bubbles in the middle and is completely contained. I use it all the time and never have had one mess to clean up! I don’t make pasta without my Spill Stopper. 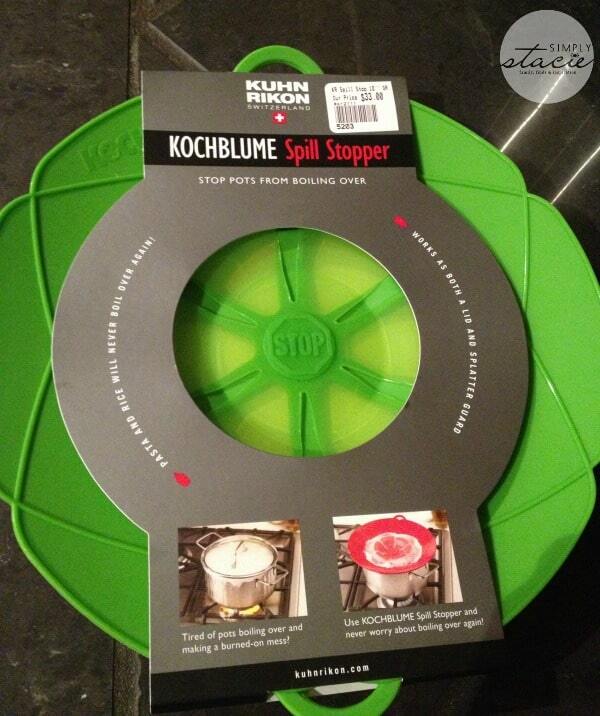 You can purchase the Kuhn Rikon KOCHBLUME Spill Stopper for $31.35 on Cilantro Cooks. They also have one in Red and a 12 inch Purple Spill Stopper. Cilantro Cooks has free ground shipping on orders over $50 in North America. While you’re there make sure to check out their other kitchenware, bakeware and cookware products. The Calphalon 5 piece non stick bakeware set would be great! I would love to own the Lodge 12 inch Steel Fry Pan. I’d love the eight inch French Bull Raj Chef Knife. Gorgeous! The ‘Joseph Joseph Chop2Pot Plus Folding Chopping Board’ is nice because it allows you to bend the board so that all of the veggies you just cut go into the pot and not all over the stove. Another item I found from the Cilantro Cooks blog that I think would be wonderful is the Fusionbrands Silicone Poach Pods for healthy easier poached eggs. I like the Cuisipro Battery Operated Hand-held Herb Chopper.